Also see DragonSlayer, Golden Dragonslayer, and Golden Dragonslayer Eclipse. *Your Combat Defences increase by 0.6*C, rounded normally. ***On Monster Category "Dragon", they decrease by (C*0.20 + 2.2)% each, rounded normally. Damage: (160 + E*4.8)% Base and Random, and (160 + E*7.04)% Stats damage. Images from Woah_lol. Update from Crimzon5, ayashi, sunchang, jimij770, Kalanyr (via algimantas2 and Sora Aeragorn). New images thanks to phoenixfire555. Typo correction thanks to Dwelling Dragonlord. 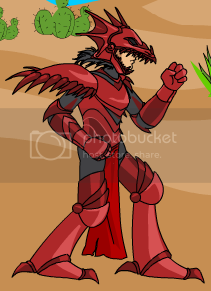 A blood red armor for elite Dragonslayers! New sellback Thanks to Breeders. Image from feral__john. Description thanks to Irios. Charge from ~Cin~.